Drug repositioning has been proposed as a potential effective shortcut to drug discovery. Among the available approaches, rational methods based on a specific molecular target can take advantage of the current availability of genome-wide transcriptional data. Unfortunately, the effects of direct drug targets are usually not detectable at the mRNA level and a more systematic approach is required to link transcriptional data to therapeutic effects. Gene2drug tackles this problem by searching for sets of pathways that are dysregulated by a drug as opposed to single genes. One way to define a set of pathways is to start from a target gene and collect the pathways that it is annotated to, thus assessing the effects of perturbing the target gene indirectly through cellular mechanisms that are expected to be involved. 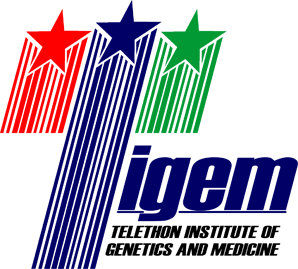 Gene2drug uses a method we called “Pathway-set Enrichment Analysis” (PSEA), analogous to the Gene-set Enrichment Analysis (GSEA). Gene expression profiles from the Connectivity Map are converted to “pathway expression profiles” and ranked according to the p-value of their Kolmogorov-Smirnov (KS) statistic. 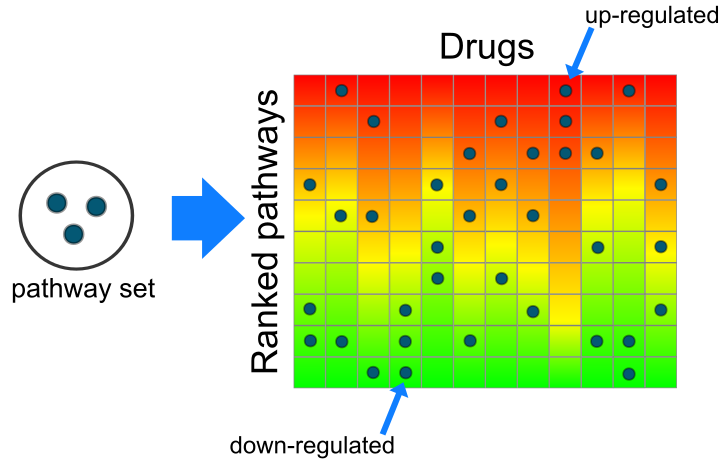 Given a set of pathways, the KS statistic is applied again to search for drugs that consistently up-regulate or dysregulate most pathways in the set. By typing the name of a gene in the “Find gene” box and choosing a corresponding result from the autocompletion popup window. The “Load” button will add to the “Pathway set” box all the sets that the chosen gene is annotated to. The process can be iterated to add more pathways. By typing the name of a pathway in the “Find pathway” box and choosing a corresponding result from the autocompletion popup window. The “Add” button will add the chosen pathway to the “Pathway set” box. The process can be iterated to add more pathways. By pasting a list of pathways, one per line, directly to the “Pathway set” box. However, pathway names must match our list of pathways, including “([database])”, as available in the Downloads link section. 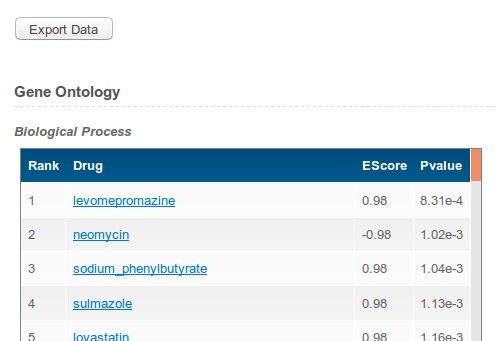 The results page shows a list of (top 10%) drugs as prioritized by the PSEA analysis. Top drugs are those most dysregulating the pathways in the input set. Enrichment score signs report whether the regulation is “up” or “down”. The p-value reports how it is unlikely for a random set of ranks to be as extreme (top or bottom) as the ranks of the chosen pathways for each drug. The “Export Data” button becomes active as soon as a full report of the analysis is ready. The report includes details of the pathway ranks for each drug. Small ranks for a pathway mean that it is upregulated (top of the profile), large ranks mean that it is downregulated (bottom of the profile). The ranks range from 1 to N, where N is the number of database for each profiles (see table above). Redistributions of source code must retain the above copyright notice. Redistributions in binary form must reproduce the above copyright notice, this list of conditions and the following disclaimer in the documentation and/or other materials provided with the distribution. This license does not authorize the incorporation of this software into any proprietary programs. THIS SOFTWARE IS PROVIDED "AS IS," AND ANY EXPRESSED OR IMPLIED WARRANTIES, (INCLUDING, BUT NOT LIMITED TO, THE IMPLIED WARRANTIES OF MERCHANTABILITY AND FITNESS FOR A PARTICULAR PURPOSE) ARE DISCLAIMED. IN NO EVENT SHALL OUR INSTITUTE OR THEIR AFFILIATES BE LIABLE FOR ANY DIRECT, INDIRECT, INCIDENTAL, SPECIAL, PROCUREMENT OF SUBSTITUTE GOODS OR SERVICES; LOSS OF USE, DATA, OR PROFITS; OR BUSINESS INTERRUPTION) HOWEVER CAUSED AND ON ANY THEORY OF LIABILITY, WHETHER IN CONTRACT, STRICT LIABILITY, OR TORT (INCLUDING NEGLIGENCE OR OTHERWISE) ARISING IN ANY WAY OUT OF THE USE OF THIS SOFTWARE, EVEN IF ADVISED OF THE POSSIBILITY OF SUCH DAMAGE. The data available on this site are in the public domain and therefore freely available. Nevertheless, this site and results made available through use of this site should not be used for the medical management of patients. Our group shall not be held responsible for your use of the site. If you are interested in incorporating Gene2drug software into another product, or have questions or concerns, please contact us.